KLM is the most punctual of the three, with almost 86% of their flights arriving on time, close to Ryanair's performance. But the Dutch airline's claim processing isn't at the level of the other two. It scored 7 overall in our 2019 airline rating. SAS Scandinavian is the least punctual of the three, with an on-time performance close to the industry average. However, they are one of the fastest airlines to pay the money they owe to their passengers (less than 4 weeks). It scored 7.3 in our rating. South African Airways is among the best airlines in the world for both flight performance and claim processing, scoring 7.4 in our rating, getting the 1st place. Only 17.77% of their flights were late in 2018 and they paid compensation to their passengers in only 22 days on average. In 2018, it took on average 4 months (123 days exactly) for airlines to pay compensation to air passengers for their delayed, canceled, or overbooked flights. By comparison, they took about 3 months and a half (101 days exactly) in 2017 - that's 3 weeks more, in just a year. Some airlines refuse to handle claims from an agency, violating their client's right to be represented by a third-party. Others have made it increasingly more complicated for their client to claim through an agency, by asking for extra documentation. A minority of airlines abuse the lack of legal knowledge of their passengers to offer low-value vouchers rather than the compensation they are legally entitled to, and pressure them into abandoning further pursuits. For a majority of travelers, price is the main decision factor driving travelers to choose an airline over another one. Budget airlines are among the most punctual in the world, with Ryanair at the top spot, with an outstanding on-time performance (OTP) of 86% in 2018. By comparison, the industry average is 75.70%. They are also faster than most of the largest carriers to pay compensation to their passengers when it is due: easyJet in particular is among the fastest to process claims, providing a reply in less than 10 days and paying the due compensation in a month and a half on average. Europe's most hated airline ranks 7th in our 2019 airline ranking. The best US carrier, American Airlines, ranks 9th, with Delta in 19th position. United Airlines and Southwest are far behind. When flights of US airlines are delayed, it's for much longer than European ones. Among the 10 airlines with the longest average delays, 4 are from the United States: 73.9 min for SkyWest Airlines, 70.7 min for United Airlines, 69.1 min for Delta Air Lines, and 62.7 for American Airlines. ...and US airlines' flights were late more often than Ryanair's in 2018. Delta Air Lines is the most punctual US air carrier and the only one with an OTP close to that of Ryanair, with 84.33%. However, American Airlines, Delta, and United were all better than Ryanair at processing passenger claim. But if the end of 2018 and the beginning of 2019 are any indication, Ryanair will also surpass the Big 3 there in 2019. Singapore Airlines, Qatar Airways, and Emirates often fight for the title of most popular airlines according to passengers. But they're terrible at paying their passengers what they are owed when flight disruptions occur. In fact, only Qatar Airways ranks in the top 20 of our airline rating, at the 11th position, with an overall score of 6/10. While all 3 are among the top 10 most punctual global airlines in the world, you really don't want to be part of the small portion of their flights that is delayed. Emirates and Singapore Airlines are respectively the 4th and 5th worst airlines in the world in terms of claim processing, with performances comparable to Tunisair, Air Serbia, TAP Portugal, or the now bankrupt WOW Air. Qatar Airways does better, but is still way below the industry average. It took almost a whole year for Singapore Airlines to pay the compensation it owed to its passengers in 2018 (343 days). Flights from Canadian airlines are among the most delayed in the world. 31 to 34% of Air Canada, Air Canada Rouge, and Porter Airlines' flights were delayed in 2018. In other words, if you're flying with one of these airlines, there is 1 chance out of 3 that you'll be delayed. WestJet is just slightly better than the industry average, with "only" 22% of their flights arriving late. On the bright side, Canadian airlines are some of the fastest air carriers to pay compensation to their passenger: about 2 months. So if you're bound to have a delayed flight, you want it to be with a Canadian airlines. Unfortunately, Air Canada has been making it more complicated for its passengers to claim compensation via a third-party agency, by refusing to correspond directly with the latter, despite their passengers insisting on being represented. 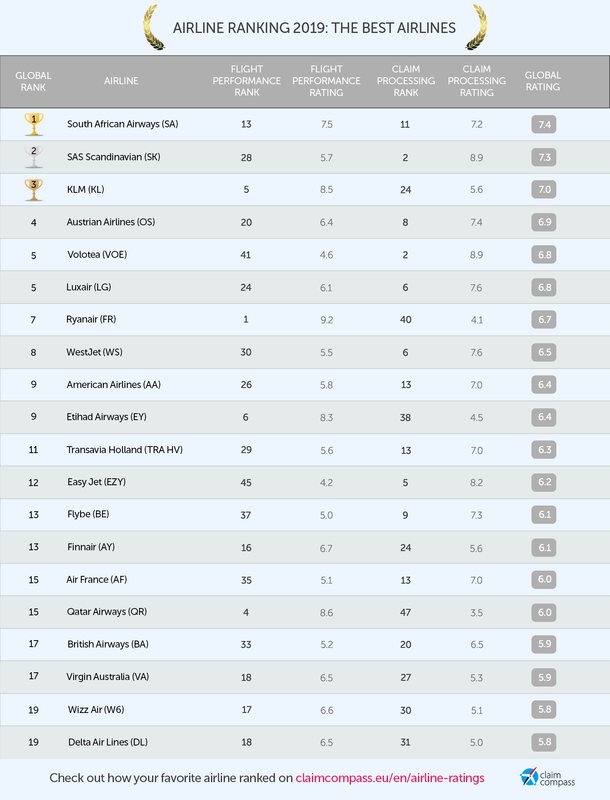 Only American Airlines and Delta made it to the top 20, respectively at the 7th and 15th position. Their flights are late more often than Ryanair, the notorious European budget air carrier. They give their passengers the money they are owed more slowly than easyJet, the 2nd largest budget airline in Europe. Only 14% of Ryanair's flights arrived 15 minutes late or more in 2018, although they operated over 600,000 flights last year. By comparison, the industry average is 24.30%. EasyJet, one of their main competitor, doesn't fare quite as well, with 24.88% of their flights late. However, easyJet proved much more efficient at handling compensation claims from passengers. Their passengers claiming compensation for a delayed or cancelled flight received their money in 52 days on average, while Ryanair's were paid in 70 days. Both airlines make it very complicated for passengers to claim compensation via a claim agency, by refusing to communicate with the latter. By doing so, they are depriving passengers of their right to be represented. They are ranked respectively 12th, 14th, and 18th in our airline rating 2019. While they make up for it with shorter delays compared to the main US airlines, their flights arrived late more often in 2018. British Airways is the "least worst" with "only" 23.21% arriving late. Air France's performance was similar, with 23.94% of delayed flights. Lufthansa, however, performed worst than industry average, with 28.74% of their flights delayed by at least 15 minutes. The three airlines were however much more efficient at processing their passengers' claims, only surpassed, surprisingly, by American Airlines. Alitalia and Iberia, the Italian and Spanish national air carriers, had some of the best on-time performance in 2018, respectively 83.48% and 82.17%. Unfortunately for their passengers, however, both airlines proved that they didn't care much for their passengers' right to receive compensation when their flight is disrupted: it takes them about 6 months to handle a claim. In all regards, TAP Portugal is one of the worst airlines in the world, flirting with the bottom of our 150-airline ranking. Only Tunisair managed to do worst than the Portuguese carrier. A whopping 38.29% of their flights were late in 2018 - that's almost 4 out of 10 flights. But the nightmare doesn't stop there for passengers, who shouldn't expect to get a reply to their compensation claim before 70 days. They also shouldn't expect to receive their money before 6 months. Singapore Airlines might be among the most popular and punctual airlines in the world, it doesn't like to enfore their passengers' right to compensation. It took them close to a year to pay their passenger what they were owed according to the EU Regulation 261/2004: 343 days on average. Most Asian airlines were not including in the rankings due to the very little amount of compensation claims they received. However, because many Asian airlines are starting to operate routes to and from the EU, they become subject to the EU Regulation 261/2004 and receive an increasing amount of claims from their passengers. Only 14.74% of ANA's flights were late in 2018, a performance that places the Japanese airline among the most punctual air carriers in the world. China Airlines is China's least punctual airline, with a third of their flights being delayed by at least 15 minutes. The country's best performer, China Southern Airlines, doesn't have much to boast about though, with 28.68% of their flights arriving late. Air India, with an on-time performance of only 60.49%, and Pakistan International Airlines, at 64.55%, are among the worst performers in the region - and the world. South African Airways ranked at the top of our 2019 airline ranking, with an overall score of 7.4 out of 10. The 2nd best African airline, Kenya Airways, ranked far behind, with a score of 5.6 only, although it operated more than 50% less flights than South African Airways. It's worth noting, however, that Kenyan Airways has been processing passenger claims very efficiently in 2018, compared to the industry average, with compensations paid in less than 2 months. 4 out of 10 Tunisair flights arrive late. Tunisia’s national carrier indeed has the worst on-time performance in the world. This is a very bad sign, before their upcoming route expansion, scheduled for the summer of 2019. Tunisair didn't pay compensation to air passengers in 2018 and refuses to deal with claims filed through an agency. The performance of Latin American airlines is average. At best. Want to see how did your favorite airline performed? Check out the 2019 airline ratings! You can learn more on the rankings and how we created these ratings in this blog post.